The Trixie Insect Shield® Outdoor Dog Blanket offer protection against biting insects. Protects against ticks, midges, ants, flies, mites and fleas. The blanket is permeated with an active ingredient called Permethrin, which is a synthetic variant of an insect-repellent substance that occurs naturally in certain crystanthemum plants. 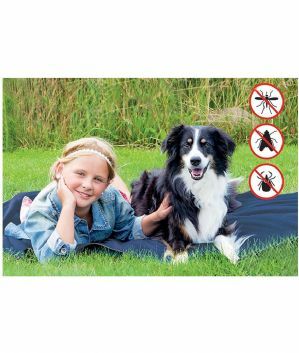 The odorless and invisible active ingredient that the Trixie Insect Shield® Outdoor Dog Blanket is treated with is completely safe for people and dogs. It ensures lasting, effective protection for at least 25 washing cycles. This clever accessory offers you peace of mind, especially at times where your pet is more vulnerable to insect-borne diseases.